A topic about use of medication – in this case, steroid (also called corticosteroids) for eczema – is likely to gather a lot of interest and invite a great debate. We feel that this is a very important topic to cover because we had been in the same position and feeling confused and fearful – and, in the journey of tests and trials, made countless mistakes and learned many valuable lessons. Today, this article will address your many doubts about using topical steroids for eczema and further, discuss the circumstances where other alternative options may be helpful. Up to 4 in 5 care-givers of eczema patients show ‘phobia’ of using topical steroid. As a result, many parents or patients themselves become excessively worried and refuse this treatment because steroid has garnered a bad reputation because of its negative side effects that are often caused by improper or over-use of high-potency steroid. Do you know that steroids are naturally occurring, and can be produced by our body for normal growth and development? One of its many functions is to control inflammation. Synthetic topical steroid was introduced to directly treat targeted skin area that needed this anti-inflammatory action. 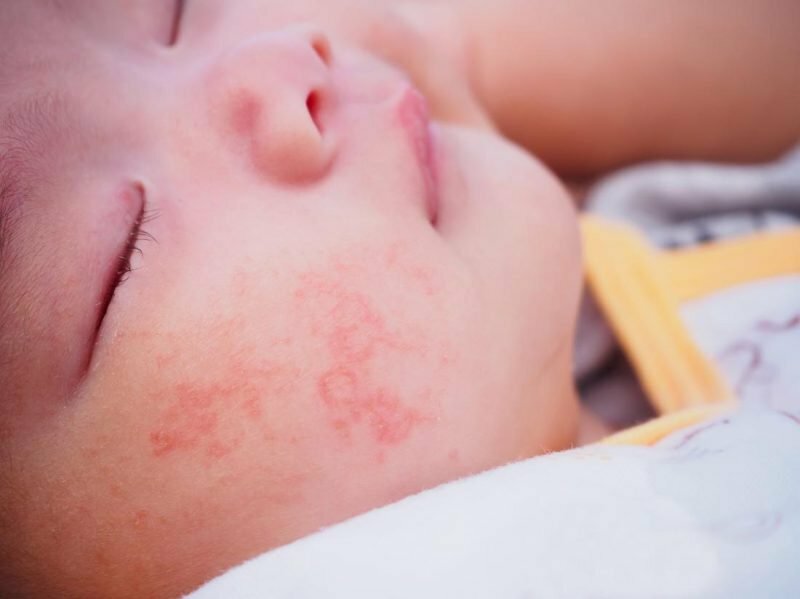 If you have tried this treatment before, you will appreciate how effective it is in control eczema flare ups and improve your child’s quality of life. Thinning of the skin is a real risk of using potent topical steroid for a long period of time without break. Signs of thinning include wrinkly skin and tiny blood vessels on skin that become more visible. Early skin thinning can be reversible if steroid is stopped. Other skin damages include stretch marks (usually appear on upper inner thigh, under arms, etc). 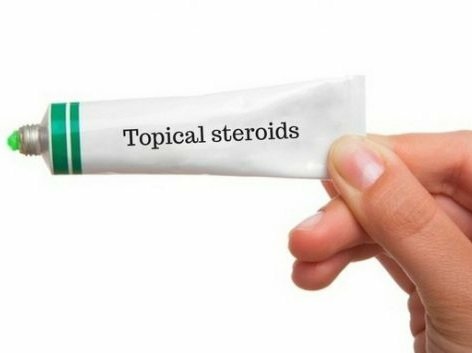 When topical steroid is used properly intermittently at an appropriate strength and quantity, these side effects of skin damage is uncommon; and is in fact effective in managing mild to severe skin inflammation. Topical steroids can only be prescribed by a doctor or dermatologist and cannot be bought over the counter. The steroid cream of the right strength will be prescribed based on your child’s skin condition. The potency of topical steroid generally comes in 4 strengths: mild, moderate, potent and ultra-potent. For example, hydrocortisone is mild while Dermovate® is very potent (and is over 1000x as strong as hydrocortisone). The higher the potency of a steroid, the higher risk of side effects it will cause. For this reason, a step-up/step-down approach is a general guideline used in the treatment of eczema in children. The lowest potency steroid necessary to treat an eczema will be used but during flare ups, the potency may need to be ‘stepped up’. In severe eczema, a stronger steroid will give a good start to bring the flares up under control then gradually stepping down to weaker steroid as condition improves. A thin layer covering inflamed area or rash is enough. 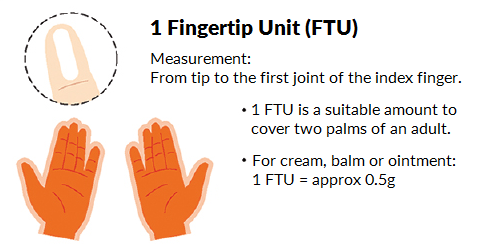 To be more precise, fingertip unit (FTU) is a method that you can use to gauge the amount of topical steroid to use on area of eczema skin that is to be treated. 1 FTU is used to treat an area of a child’s skin that is twice the size of the flat of an adult’s hand with fingers together. A mild steroid will typically be prescribed. Maximum 2x a day. It may need to be used 2 to 3 days until skin has return to normal or up to 2 weeks. Only use them on active inflammation, that is, the red-typed rashes. Apply on cleaned skin surface. For different parts of the skin, the doctor will prescribe different potency, that is deemed appropriate. The face, eye, neck, inner elbow, back of knees and wrists are generally thinner and more sensitive and delicate than other parts of the body such as the knees, soles or elbows. The chart on the right is a rough guide from Patient (https://patient.info) for your reference. When NOT to use steroid? Where there is no inflammation or red-typed rash, but just dry skin that is itchy, there is no need to use steroid. Just apply lots of moisturizer. This is a term that is used to describe eczema skin that is ‘addicted’ to or dependent on topical steroid to the extent that when they stop applying, the skin will experience ‘withdrawal’ or adverse symptoms, also known as Topical Steroid Withdrawal (TSW) symptoms. How to prevent Topical Steroid Withdrawal (TSW)? In fact, to prevent TSW is as simple as to not mis-use it in the first place! Don’t use it as you are using your moisturizer. Apply due care and diligence when applying topical steroid and doing it appropriately according to instructions, it is highly unlikely that withdrawal syndrome will occur. 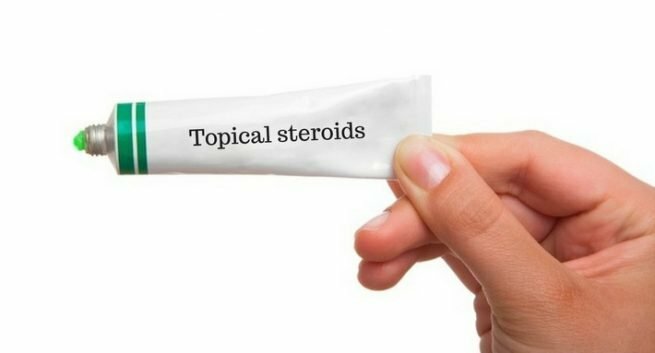 Topical Steroid vs Natural Emollient: Which is Better? It does not have to be one or the other! In fact, a combination of different topical agents has found to improve the therapeutic effectiveness of topical treatments for eczema. At least 50% of parents are using alternative or complementary treatments of some sorts with steroid. Mild Eczema – Emollient is the main and most feasible primary treatment. Moderate to Severe Eczema – Combine emollients with topical steroid. Emollients are found to have beneficial steroid-sparing effect, meaning it is able to reduce the need for topical steroid by up to 50%. Severe Eczema – Steroid is needed in most severe cases of eczema to treat flares effectively, as it is more efficient and faster in action. Treating with emollients can be taken after your doctor evaluates your child’s overall condition and degree of inflammation. Wet-wrap is also commonly applied when dealing with more severe cases of eczema. Maintenance or secondary prevention refers to an optimal care for the eczema skin that returns to normal following flare ups to avoid dryness and prevent relapses. During maintenance, it is just as important to continuously apply emollients to entire surface of skin (not just specific affected skin area) at least twice daily, especially after shower or bath. To maintain integrity of the skin barrier, effective moisturizing must also be combined with mild cleansing and appropriate bathing regimen. Recap of articles on ‘Moisturizing’ – Refer here and here. Recap of articles on ‘Bathing’ – Refer here and here. To sum up, side effects of topical steroid is an understandable worry from a parent’s standpoint. No medication is completely safe and free of side effects. Furthermore, eczema is chronic and differs from one child to another. The best treatment regimen for your child is one that is tailored to address your child’s condition – there is no convenient one-size-fits-all program. When you can appreciate that if topical steroid is used sensibly and correctly, it is safe and effective; especially in severe cases where the benefits will outweigh its risks. By applying integrative management, you will reduce unnecessary suffering for both yourself and your child with improved quality of life, less stress and healthier emotion. In Combined Approach for Your Child’s Eczema Treatment, we will go through the ‘Combined Approach’ of self-help that you can learn and teach your child as young as 5 years old about how to prevent habitual scratching that causes persistent damage to skin. Your child needs to stop scratching in order for her skin to heal and recover and in order to achieve this, you will need to deal with her scratching ‘habit’, which is an important aspect of the Combined Approach of eczema management. This entry was posted in Baby Eczema, Eczema & Dermatitis, Eczema & Moisturizing, Eczema & Steroid and tagged eczema steroid use infographic, how to use steroid on kid, maintenance after eczema flare up, preventing eczema flare in kid, severe eczema and steroid role, steroid addiction and baby eczema, steroid and acute eczema, steroid and fingertip use, steroid and moderate eczema, steroid or moisturizer in acute eczema, steroid use and baby eczema, steroid withdrawal symptom and eczema, topical steroid and eczema, treating baby eczema with steroid cream. This article is misleading on the nature and cause of topical steroid addiction and completely downplays the risks. Most people who find themselves in topical steroid addiction do so because they followed their doctor’s instructions. The problem with steroid addicted skin is it never clears properly and actually continues to get worse. When they go to their doctor about this, they are told to just keep applying steroid creams “until the skin is clear.” The problem is, it is never clear! And we are told to just keep using, never realizing that it is the creams causing this pain in the first place. So your lighthearted “just don’t misuse it in the first place!” is completely misguided. Thousands of parents use topical steroids exactly as prescribed by the doctor and still find themselves in this horrible position. Hi K, thank you for your comments. I can understand where you’re coming from being a chronic sufferer myself and had taken oral steroids (and dealt with steroid withdrawal) in the past to keep my autoimmune condition in check. In my journey of healing from chronic illness, an important lesson I learned was that management of an autoimmune condition should be carefully performed with an integrative approach, i.e. with the use of both conventional and holistic approaches in a balanced manner. 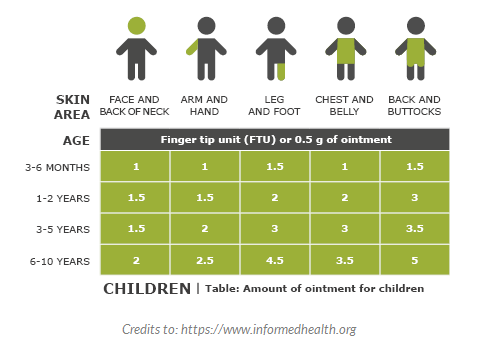 The whole idea of having this article about proper topical steroid use for a child’s eczema is to educate many first time parents with children suffering from eczema about how to properly use topical steroid cream prescribed by their doctors. We have come across many parents who are using steroid cream much like daily moisturizer – turns out they have not been told how to use, how much to use, when to use or when to stop use. Many aren’t even aware of the concept of a steroid withdrawal.